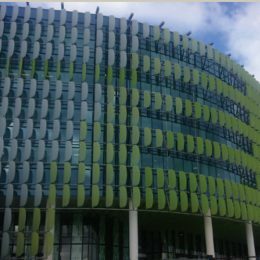 Precast has provided a cost saving solution for the $1 billion Royal Children’s Hospital currently under construction in Victoria. 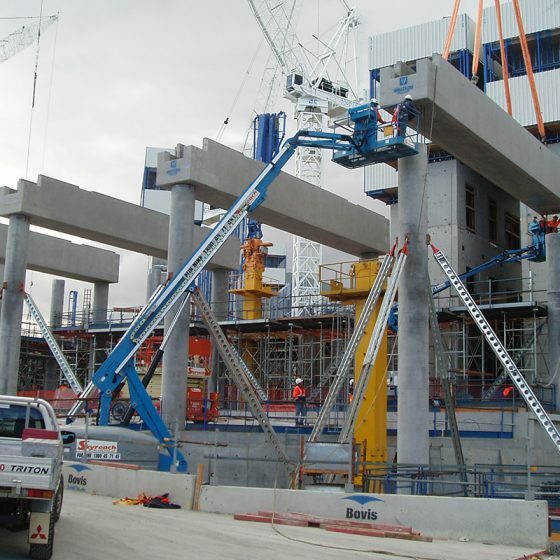 Victorian company Westkon Precast has been involved with the project for the level two transfer slab and has been responsible for the design, manufacture, installation and certification of the structure. With Bovis Lend Lease honoured with the Excellence in Health and Safety award at the Master Builders Association of Victoria for its work on the project, a high standard of safety was required for all companies involved. “Bovis had high standards on safety and everything had to be documented. This was a complicated structure that we had to build in stages to meet their program and access,” says Lorenzo Cremasco from Westkon Precast. Bovis had originally designed the transfer slab as an in-situ product, but early in the project explored the idea of using precast for columns, beams, hollowcore planks and the whole transfer slab. 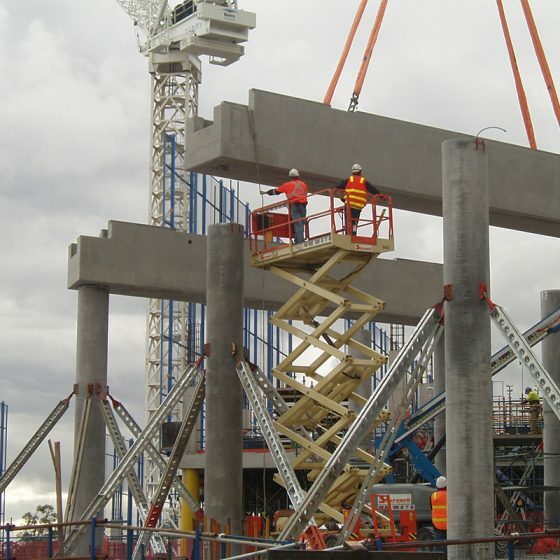 A massive 350 tonne mobile crane was transported to the site from Sydney to lift the 32 tonne precast shell beams into position, which required part of the site to be shut. “The large mobile crane was set up adjacent to the structure. 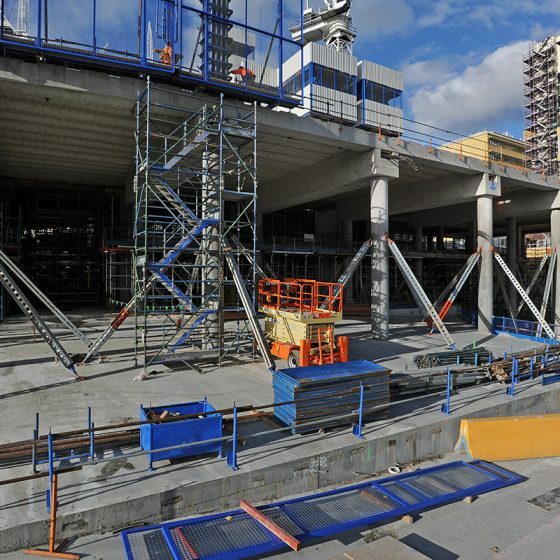 The location of the crane required complex engineering because it was located on a suspended slab,” Cremasco says. Access wasn’t the only challenge on the project. The precast manufacturer also deviated from its usual process of using beams which supported the hollowcore and slabs. “The beams on this project had a special feature where they were hollow. 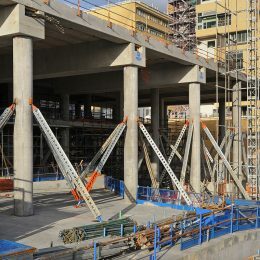 Normally beams are pre-stressed, however these beams were post-tensioned after the screed had been poured, to support future loads,” Cremasco says. Due to the large scale of the project and the massive weight of the columns, the precast company spent around three months involved in pre-design work configuring the logistics of the installation. This ensured as smooth a process as possible. It also spent a substantial amount of time certifying the structure, working in consultation with Bovis and Irwinconsult to ensure it met Bovis’ requirements and also adhered to engineering standards. 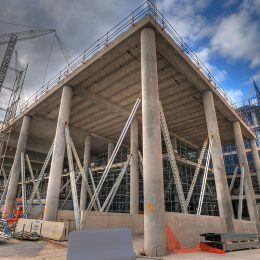 Initially, Cremasco says the project seemed daunting due to its large scale, but after breaking it down into smaller parts, he realised how much time was saved using precast. “It is not uncommon for similar slabs, if done in-situ, to take double the length of time compared to this one,” he says. 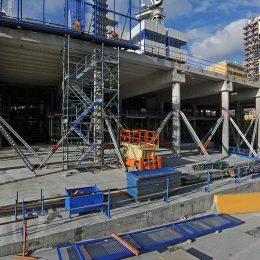 Stage one of the project will be completed in 2011, while stage two will be completed in 2014. On completion, the hospital will feature a 5 star Green Star rating under the Green Building Council of Australia’s health pilot tool.